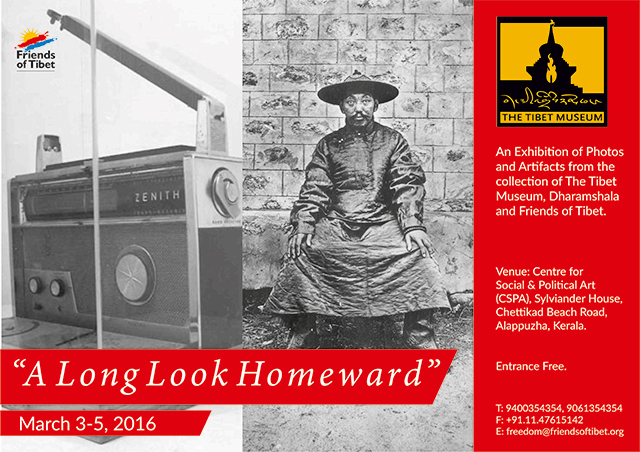 'A Long Look Homeward' — a travelling exhibition of photos and artifacts from the permanent collection of The Tibet Museum of the Department of Information and International Relations, Dharamshala and Friends of Tibet started its journey on March 3, 2016 from the Centre for Social and Political Arts (CSPA), Alappuzha, Kerala. The exhibition remained open to public from March 3-5, 2016. Sylvie Bantle, noted German writer and theatre artiste welcomed the gathering. She opined how important it is to have healthy roots back to our land, our religion, our memories and culture which would enable one to stand with strong legs on a strong ground. The inaugural started with a minute of silence as a mark of respect to Dorjee Tsering, a 16 year old young martyr from Mussoorie who self-immolated protesting the illegal occupation of his motherland by China. Traditional Tibetan Butter lamps were lit by five Tibet supporters and the whole atmosphere was filled with support for the Tibetan cause and how the Chinese occupation and the draconian Chinese forces is a long-term threat to the society at large. 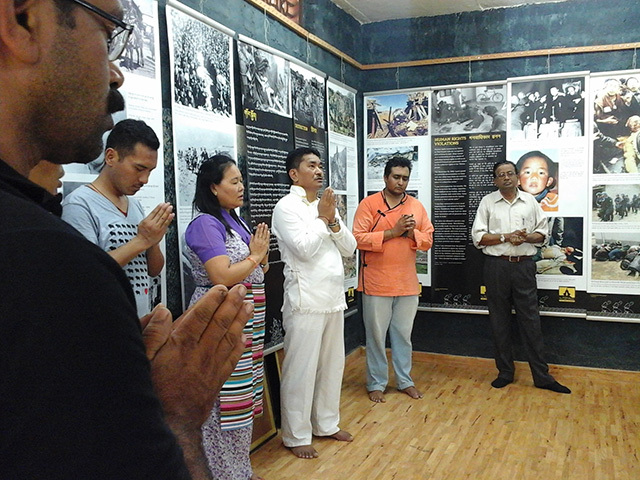 This was followed by Tibetan Universal Peace Prayer sung by the team from Men-Tsee-Khang. 1) Prayer for the Universal Prayer led by Dr Dorjee Rapten Neshar of Men-Tsee-Khang, Bangalore. 2) Sylvie Bantle, noted German writer and theatre artiste welcomes the gathering. 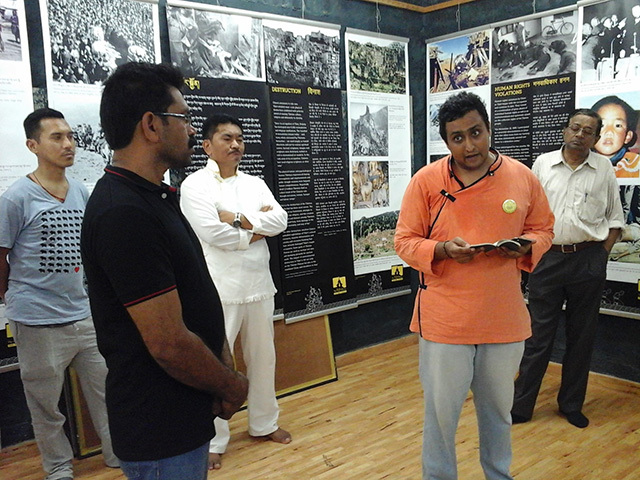 Dr Dorjee Rapten Neshar, Chief Medical Officer, Men-Tsee-Khang Bangalore, dedicated the exhibition to Dorjee Tsering who laid his life for the Tibet cause. He shared how his fellow countrymen inside Tibet have absolutely no way of expressing their resentment against the illegal Chinese occupation and Chinese atrocities and human rights violation. He emphasised how in a free country, one can voice one's opinion and resentment in a peaceful manner, by raising slogans and peaceful demonstrations, but it's not possible inside Tibet. As an extreme measure, Tibetans are forced to give up their life by means of self-immolating themselves to vent out their frustrations and send a strong message to the illegally occupied Chinese Forces and to the outside world. Their words during the act is for Free and Independent Tibet and for the Long life of His Holiness the XIV Dalai Lama and that come back to Tibet and that the Tibetans inside and in exile re-unite. P Sreekumar, a Tibet supporter from Kochi shared his experience about his journey to Kailash Mansarovar and gave a first-hand experience of the human rights violation inside Tibet and how the ordinary Tibetans are forced to beg in their own land, leading a miserable life, and how their voices are crushed and silenced. Poet and Friends of Tibet Campaigner Eswar Anandan introduced the theme of 'A Long Look Homeward' to the audience. He dedicated his poem 'Flames of Truth' which was written a year back when a 20-year old Tibetan girl had self-immolated. 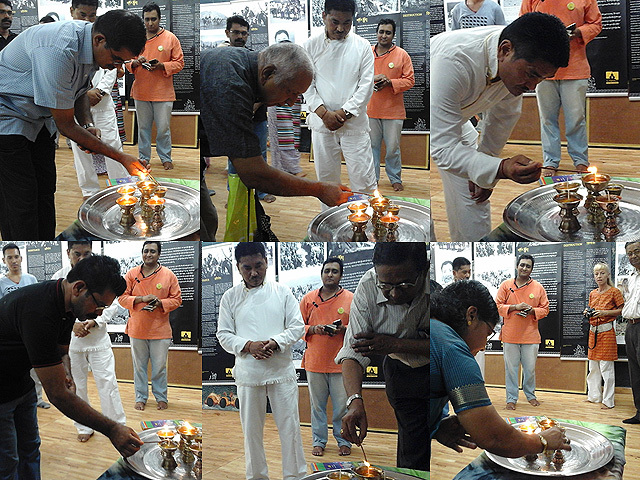 1) P Sreekumar, a Tibet supporter from Kochi shares his experience about his journey to Kailash Mansarovar, Tibet. 2) Poet and Friends of Tibet Campaigner Eswar Anandan introduces the theme of 'A Long Look Homeward'. The photo exhibition from the collection of The Tibet Museum brings to light Tibet's recent history — the Chinese occupation and the Tibetan exile feature photographic narratives of the illegal occupation of Tibet and the journey of the Nation now in exile. While the exhibition of artifacts from the collection of Friends of Tibet display the Zenith Royal 1000-1 Wavemangnet Transistor Radio used by HH the XIV Dalai Lama in Tibet and in exile; coins and currencies of free Tibet, the first Tibetan Passport used by Tsepon Shakabpa, Chairman Mao's 'Little Red Book' and a uniform adorned Chinese soldiers during the invasion of Tibet which lasted for about ten years from 1949. The 1934 September edition of the National Geographic magazine carrying the image of the Tibetan National Flag in the 'National Flags of the World' section. 1) Tibet supporters light traditional Tibetan butter lamps. 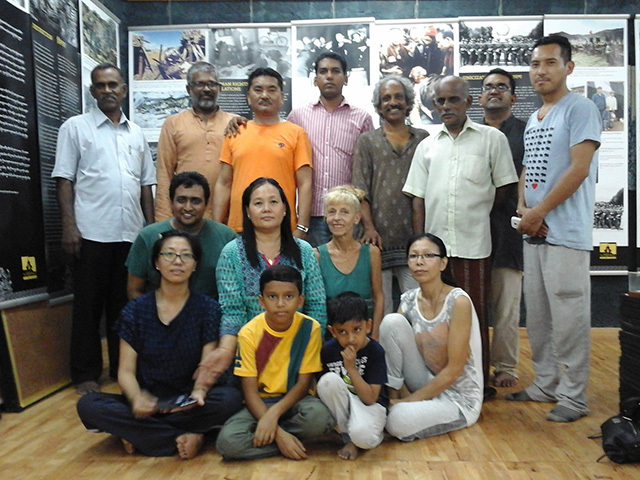 2) The Tibet Museum, Dharamshala; Men-Tsee-Khang and Friends of Tibet representatives pose for a group photo. "A Long Look Homeward is an eye opener for art enthusiasts and photography lovers about how a nation now in exile still maintains its rich heritage and culture in spite of the continuing well strategised effort of China to slowly erase the heritage from the memories of people worldwide and within Tibet" said Tashi Phuntsok, Director, The Tibet Museum. 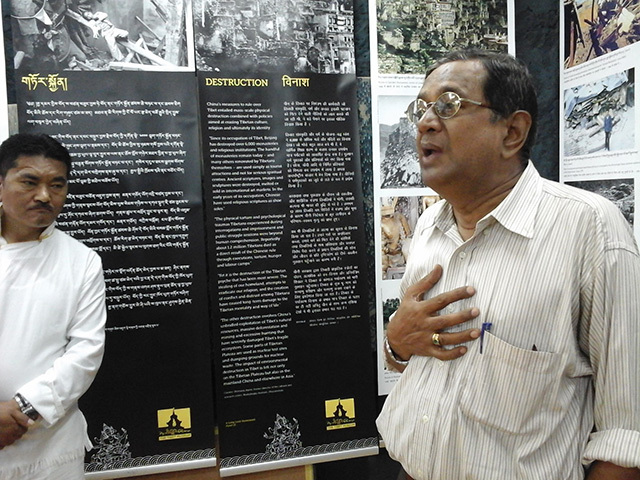 The exhibition was well attended by people from various walks of life who came from the length and breadth of the state. It was a unique experience for the general public in the local neighbourhood who got a chance to experience the Tibetan history, which was often misrepresented. Journalists from leading newspapers, local and national arrived to cover the event. Reports about the event appeared in the local edition of the leading Malayalam newspapers and is being reported in the national edition of a popular English Newspaper. "A Long Look Homeward" exhibition will travel to Thiruvanthapuram, Kochi and Calicut before it moves to other Indian states. 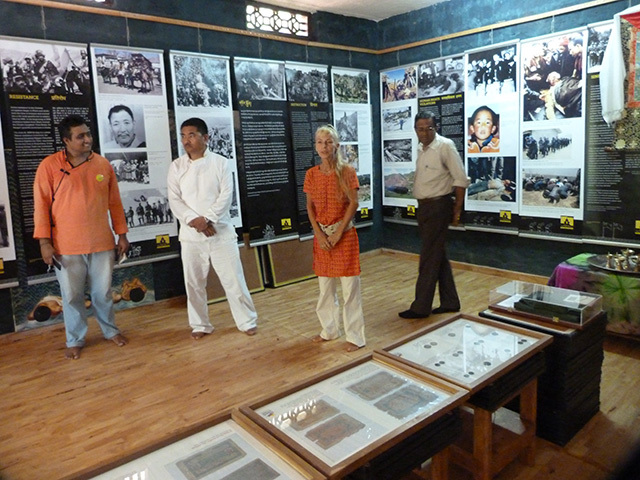 About The Tibet Museum: The Tibet Museum of the Department of Information and International Relations is the official museum of the Central Tibetan Administration and is located in Mcleod Ganj, Dharamshala. Through photographs, videos and installation, Tibet Museum aims to disseminate knowledge of Tibetan history and culture while raising awareness of the occupation of Tibet and the on-going human rights abuses committed by China. Established in 1998, the Tibet Museum now has a collection comprising over 40,000 photographs, a traveling exhibition, and a permanent exhibition that documents the Tibetan journey into exile across the Himalayan ranges.